These are all Chinese is very great. These are all nice picture for me wish they everyone the best. Good info and pics...Keep up the good work..
Hello, I really would like to visit these Tulou or Hakka Tulou. 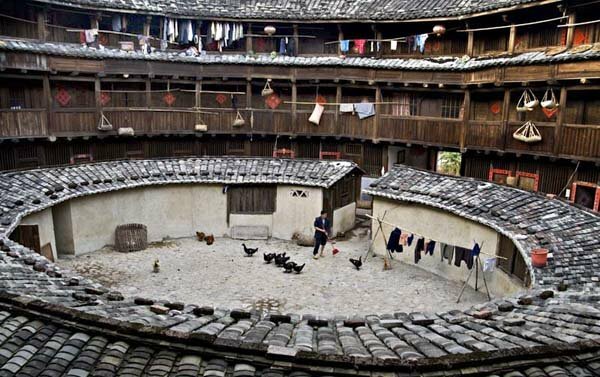 From what I understand most Tulou are located in Fujian and neighbouring Guangdong and Jiangxi provinces. I found this: http://www.hereischina.com/Features/tulou/index.htm But they only seem to arrange trips to Fujian? Could you recommend any other tour operators? -- This is the Xishuangbanna Dai village,china. Dai nationality bamboo house is the traditional residential areas, Yunnan province is precious typical representative of the national culture, is a valuable tourism resources. The protection of national culture is built in the province "Great Province of Ethnic Culture," and foster the growth of the tourism industry a very urgent task. I'm doing this huge project on the Qin Dynasty and I need info on religion, laws, economics, food, education, architecture, language, technology,and the role of women. Please give me any websites that will help me!! I really like the pictures! I have some pictures of a cross section of a wall. I could send them to you. I visited these Tulous in Dec 2009. They are well built and very beautiful. My father spoke to them in Hakka (we are hakkas,visiting from Singapore) Mostly older people there now. Most of the young people have gone to the cities to work. if you happen to see this, I would love those pics. Message me! Greg did send me some nice photos of wall construction and I just posted one of them in this blog post. Sure. Send me your email address and I'll send you some pics. Is there any way to get any technical specs and/or architectural drawings of the round Tulou? The best resource for detailed descriptions and drawings is a recently published book by Huang Hanmin titled "Fujian Tulou: A Treasure of Chinese Tradition al Civilian Residence" This English edition may b e hard to find. I have the Chinese version, and it is indeed a treasure of a book! I like the architectural design. Schools and shelters can also be designed that way. Very sustainable! HI, sorry for the late reply. To visit one of these Tulou, you can fly to Xiamen in China and book a bus ride from Xiamen to Yongding (about 2 hours). The weather there is colder than in the town. Check with a travel agency. I visited Xiamen and Yongding in 2009 December. I like the way the Chinese constructed these tulous. Simple and yet very durable. You have to admire their excellence in architecture. I am a student currently doing a comparative study on the spatial layout of the Traditional Tulou as well as the Tulou Contemporary Housing and I was wondering if there are any more images that you could share with me. I know no other way to send you a private message but will be checking back on this page for any further developments.